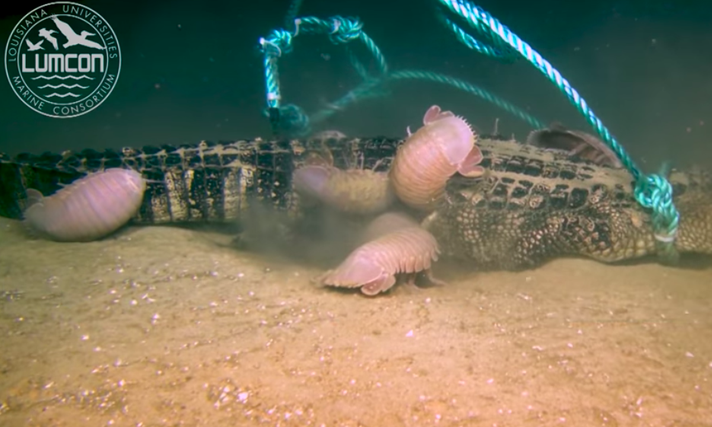 To learn about some of the mysterious creatures that live on the bottom of the sea, scientists are making them an offer they can’t refuse: free food. Chief among these sea bottom dwellers are giant isopods, scientifically known as Bathynomus giganteus. They’re related to the common potato bugs seen in gardens, but are an ancient ancestor. According to the Aquarium of The Pacific: “From the fossil record, it is thought that giant isopods existed more than 160 million years ago, before the break-up of the supercontinent Pangaea.” LUMCON scientists estimate the species is 200 to 300 million years old. Part of the reason these creatures have survived for so long is their ability to muddle through periods of famine. Giant isopods can go a remarkable four years without food. But they’re carnivores, and when they can find a big haul like a whale carcass, they feast to the point of “compromising their locomotive ability,” according to the aquarium. But “food falls” are incredibly rare, so it’s worth it.